Park West School (PWS) is a P-3 (Public Private Partnership) school, owned by a private sector company (Scotia Learning Centres) and leased by the Province of Nova Scotia for use by the Halifax Regional School Board. It is in Unit 3 of the Halifax Regional School Board, and is part of the Halifax West High School Family of Schools. Park West School opened in September of 2000. The building was designed to accommodate approximately 560 students. It is located in the heart of Clayton Park West, a community within the city of Halifax. It has one of the highest population densities in metro Halifax, and is one of the most ethnically diverse communities in Nova Scotia. All students live within walking distance of our school. Park West School offers support to newcomer students and their families through our English as an Additional Language (EAL) program, and our on-site YMCA Newcomer Support Worker. The Park West School building encompasses 71,460 square feet. Our facility includes: regular classrooms, speciality classrooms (for art, music, etc. ), common learning areas (“pods”), gymnasium (with an abundance of physical education equipment), library (with an extensive collection), resource rooms, guidance office, cafetorium (with a stage), full service cafeteria, learning centre, an elevator, and technology lab. In addition, we have four portable “chalet” classrooms on our site. Our grounds include a large playing/soccer field, basketball courts, and playgrounds. We are a technology rich facility. Many students attend our school for ten years (from grade primary to grade nine) which allows for continuous growth in the same safe and familiar setting. This allows for the fostering of lasting relationships with teachers, peers and community. Our older students are able to take advantage of many opportunities to mentor younger students, to foster meaningful relationships, and develop leadership skills. We offer a band program for students in grades six – nine, and a strings program to students in grades three – nine. EXCEL childcare (offered by HRSB before and after school) is available on-site for a minimal charge. 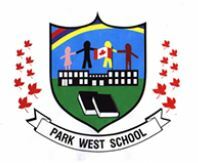 The staff at Park West School is devoted to meeting the needs of all learners, improving student achievement, and modelling a commitment to lifelong learning.